The roads and weather were fantastic all day. No pics from me as I didn't carry my camera. Click on the links below for splendid photos of the day from others. My goal was to limit idle time today and cameras encourage idle time. We rode through many picture worthy views today. The lighting was amazing with sun rays shooting through gaps between the clouds lighting up mesas and cliffs. We were in big country today. I nailed my goal finishing the route on my 32x18 with 107 miles, 9577 ft total ascent in 8:35 with only 21 mins idle time. That's really good as I had 2 minor mechanicals counted in that time. I was nervous before the start of this one cause of how wet it was. I wore my goggles!! Except for a 50 yard section of clay that some folks did not ride, the rest of the shortened route was awesome. No pics from me tho' as I didn't carry a camera today. The skies looked like this at sunset. Well it rained for most of the night (crap). Forecast for today looks the same as yesterday. This knocks Anasazi, Barrel Roll and Cove Wash out of rideable status. Believe me you don't want to go there. 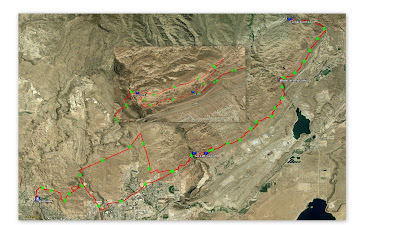 Plan B for today is to skip all of those trails and start with the Green Valley Race course. Green Valley, Barrel Cacti and Zen loops will all *probably* be fine. Maybe we can do 2-3 laps on that course. It is fun enough to ride over and over again so will still be a first class day. Bailout points to pavement are many and quick. From Starbucks we will stay as a group to the point where we connect with the GPS file. From that point it is mostly single-track so we will spread out. Plan C is to ride on the road, plan D is to go back to your hotel and watch The Bachelor nah - we gotta ride if we are having dinner at Golden Corrall. Dinner is 6pm and we have a group area reserved under my name. Day 3 heads up: If we get nothing but non-stop rain from the sky we will still ride to the top of Starvation point at mile 21 on the GPS track. The road will be fine to there. After that everyone is on their own. I have no idea what the roads East of I-15 will be like. They will certainly be slow and soft so making the full hundie is now a VERY big challenge. Well it rained all day. hmph.. So we had to ride a shortened route to avoid muck. Only 40 miles but it took 4 hours with the soft wet sand. At times it was wet! Turn out tallied 2 women and about 19 times as many chaps. Nearest was me (2 blocks) and furthest was Matt (NY). and some new faces too. It may be called Camp Lynda but it is not at all about me and I think that is really cool. It is all about a great bunch of people having fun on bikes together. Have a plan. For those of us doing long events in the next month it's perfect, for those coming out of the winter closet not so much. Shortcuts explaned below. Sunrise is 7:42, sunset is 5:51. This gives 10 hours of light with the 8AM start time. I expect to take about 8 hours moving fast with few stops. I'll still be bringing a light. If riding SS 2:1 (26er) is the minimum gearing recommendation. We will be in some remote spots. Be ready. Coyote spring is at mile 55. It's reliable and piped. Lynda thinks it tastes bad though and shuts her gut down so be wary. Click this for the visual. The red route is the Warner valley exit. Q: how do I get the files onto my Garmin 705? A: If you haven’t yet upgrade your 705 firmware to 2.60. It handles track data much better than previous releases. After that, simply drag & drop the files to the garmin/gpx folder. Disconnect from your PC and turn it on – settings->saved tracks->select the camp lynda file of interest, map setup-> pick an obvious color and set it to display on the map. Click OK and that should have you up and running. All 3 routes are in this zip file: Camp Lynda 2009 Routes. Alternatively, each day's file can be downnloaded from each day's link. We'll start off just like last year with an out and back to the high point above Silver Reef. Along the way we'll put tracks on T Bone hill, Church Rocks and Prospector trails. There is a year-round spigot at Red Cliffs park - note the waypoint. This makes it a 2 bottle ride (or one for true camels). 5+ hours on this day. More flow than tech today. Go full size on the pic below for an inset showing directional arrows for the Church Rocks section. There is one significant bit of climbing to the turnaround point. The elevation is high enough we may get turned back early by conditions...haven't been there for awhile so we'll find out together. The route is slightly confusing if you don't know it...look to the green direction arrows for clues, and of course open it in TopoFusion to get the real detail you need. We do the 2nd downhill of Green Valley Racecourse 2 times. The first time down we'll turn right onto Barrel Cacti before the end of the descent, the next time down we keep cruising on to Zen. Clear as mud? Maybe this will help. There are no long climbs but that doesn't mean there isn't any climbing. Lots of rolling terrain with the most challenging climbs at the end in Zen. If you've had enough before the end, all routes east lead to town. Naturally, we've designed the routes with our next race objective in mind. That'd be Old Pueblo 24, SS. Today's route is long and fast, just like OP. There are 2 significant climbs, but overall the route is very fast and non-technical. A dirty century is on tap. Elevations for this file are not exactly correct - had to use DEM data. High point is closer to 3800, not 5k'. At 5k' there is white stuff in these parts. Distance, if anything, is underestimated. No promises on the weather but it doesn't seem to change much lately. Jeff Kerkove, LW Coaching athlete and Ergon's go-to marketing guy, will be attending all 3 days of Camp Lynda. For those that are also attending Jeff will allow those interested in demoing Ergon product during the 3 days of camp. Nothing like taking the products straight out into the elements. In order to demo, you must present a valid credit card at the time of picking up product. This info will be recorded in case you decide to steal the product ;) Upon return of the product at the Starbucks start/finish on Sunday, the credit card info will be returned to you. Jeff will be on hand on Friday at the starting point from 9 AM until roughly 10 AM to install and get folks set up with product. If you are interested in demoing any product during the 3 day camp, please e-mail Jeff at jeff.kerkove@ergon-bike.com to express your interest or ask any questions. Note, only product requested via e-mail will be brought to St. George. Please try to request product no later than Tuesday, January 20th.